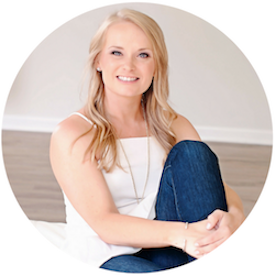 The Blush Magnolia | a southern lifestyle blog: Want to lend a helping hand? I'm still here. Still without power - both at Corey's parents' house and our apartment in Hoboken. I'm having my car serviced because the engine light chose the middle of a hurricane as an appropriate time to come on. The up side - I'm enjoying the power, heat, and wireless internet at the Volkswagen dealership. And drinking all their coffee. Corey and I returned to Hoboken yesterday to check on our apartment. We cleaned out the refrigerator and freezer since everything was hot and there is no estimate for when we will have power. FEMA and the National Guard are in Hoboken so it might be today or tomorrow or it might not be for nine or ten more days. Unfortunately, the anniversary tier of our wedding cake had thawed completely out and was warm so we had to throw it away, which completely broke my heart. But not as much as my heart broke when Corey and I went on a walk to find a charging station (people from out of town have brought in generators and hooked power strips up to them) for our phones and food (out of town food trucks have come into Hoboken so people can eat.) 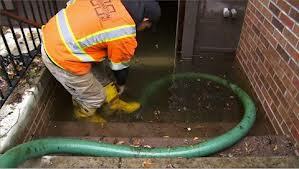 On our walk, we saw basement apartments still flooded, with authorities helping to pump them out. While the water has now receded, people in ground floor apartments were flooded as well with flood waters rising up to 8 feet in some neighborhoods. And these waters were filled with dirt, debris, and raw sewage. 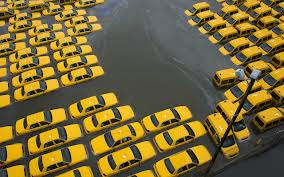 Hoboken is an older city so sewage and waste combines with runoff water from the streets, meaning that when the city floods, all of that is in the streets. And this time not only was it in the streets, but it was in people's homes destroying everything they own. While some people have homeowners and renters insurance, there are others who did not have it and have literally lost everything. 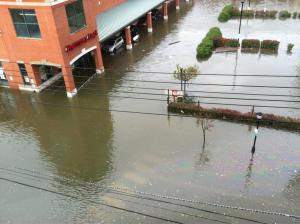 This picture of the floodwaters is of the grocery store across the street from my building. While we were walking yesterday, we noticed condensation in almost every car we saw along the streets. People tried to park their cars in garages but even those that were able find space before the garages were all full were not necessarily safe. The attendant in our garage said that there were over 150 cars that were flooded and totaled on the bottom floor of the garage. 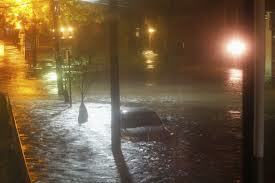 Others were advised to park on streets that were above sea level and usually don't flood - but those streets did as well. Hoboken is starting to get back on its feet. The National Guard has been in town since earlier in the week, rescuing people (and pets - see below) from flooded apartments and bringing by non-perishable foods. A five day old baby was rescued from a flooded apartment and supplies were brought to residents trapped in a senior facility. FEMA and our power company have been working around the clock to clear power substations of standing water, remove fallen trees, and try to restore power to the 50,000 residents of Hoboken. If you're interested in helping and are local, donations of non-perishable food, baby formula, and blankets can be delivered to Hoboken City Hall at 94 Washington Street. If you feel called to help but aren't local, a New Jersey blogger has set up a relief fund on her blog. The Red Cross is also accepting donations specifically for Hurricane Sandy victims. I know that if just a few of us donate two of three dollars - the cost of one of those red holiday cups at Starbucks - then we can help reach the goal and provide some relief to those who were most affected. 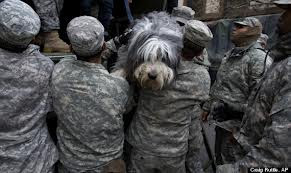 I'll leave you with my favorite picture - the National Guard rescuing one of Hoboken's four-legged residents from an apartment. Did you know that there is a new law passed since Hurricane Katrina that offers incentives for rescuing pets so that they won't be left behind in another disaster? Hang in there! Thanks for telling us how to hope. Glad you are ok.
Aw this all breaks my heart for everyone suffering. I'm glad that everyone I know is safe and sound after the tragedy, when others weren't so lucky/prepared/smart. No matter how prepared a city thinks they are, it's always hard to bounce back. I'll be making a donation today! Absolutely heartbreaking. :( I'm glad you're ok! And thanks for the heads up on the donations! Wow, I am so sorry. What devastation. I know this is so hard for you. We had an ice storm here that left us without power in the December after we were married in April. Our wedding cake dethawed, too. So sorry. Ugh I hate you all still don't have power. I bet your baker will bake yall a new cake top so don't worry about that! I know exactly what grocery store that is....when I dated a guy in Hoboken, he lived at 11th and Clinton so I think that's the one we walked to.